As professional roofers in Innisfil, we’re here to exceed your expectations with our roofing services. Our professional roofers have over 50 years of experience, which makes our team capable of handling almost any roofing situation with ease. Thanks to this experience, our team is not only highly capable, but also knowledgeable about different roofing products, repair strategies, and maintenance requirements for all sizes of roofs. You can trust our professionals to give you reliable, evidence-based advice and for them to provide excellent service from start to finish. 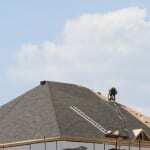 On top of all this, our professional roofers only work on one roofing project at a time. This way, we’re able to dedicate our attention to one project without getting distracted by other deadlines. Due to this, you can expect our team to give you focused, dedicated service throughout the duration of your roofing repair or replacement project. The next time you need help from a professional roofer, we’ve got you covered! Contact us at Slippery Slope Roofing today to find out more about our roofing services and what sets us apart. At Slippery Slope Roofing, our professional roofers proudly serve Innisfil, Orillia, Bradford, Alliston, Newmarket, Midhurst, Cookstown, Beeton, Barrie, Angus, Collingwood, Wasaga Beach, Oro-Medonte, Midland, New Tecumseth, Clearview, Bradford, Essa, Stayner, Springwater, and surrounding areas of Ontario.